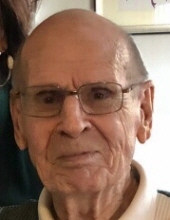 Charles (Charlie) J. Ruffing Sr, 86, of Coatesville died Monday March 25th 2019 at Freedom Village, West Brandywine with family members close by his side. He was born on Feb 12th, 1933 in Locust Gap PA. He was the son of the late Joseph T. and Emma Bradley Ruffing. He was the devoted husband of Joan Costa Ruffing, with whom he shared 62 years of marriage. Charlie was a member of St Joseph's Church, Coatesville, PA, and prior to that St. Cecilia's Church of Coatesville, where he served as a Eucharistic Minister and was a member of their Knights of Columbus. Charlie graduated from Bloomsburg State College in 1954, and then served in the US Army. In the late 1950's he headed to Coatesville to teach. He first taught at Craig Ridgeway, then Benner Elementary, and then finally Gordon Jr High - 6th grade English. He taught in the Coatesville Area School District for over 30 years. He was adored and respected by so many students and fellow teachers, and many people to this day comment on how he was their favorite teacher. He touched the lives of so many with his gentle manner and his caring demeanor. During the summer of his teaching years, he painted with other teachers from the district and formed lasting friendships, many who were still close personal friends up until the day he died. He cherished the time spent with the guys, and always had funny stories to share with his family about the painting crew. Charlie played Semi-Pro Basketball with a team called the Mt Carmel Apollos. Friends and family went on to call him "The Greatest Free Throw Shooter of All Time". He enjoyed spending time with his family, reading his newspapers from front to back, doing his crossword puzzles and watching sports, especially the Phillies with Tom, his son-in-law and the Flyers with his son Dave. He was a humble man, but had the gift of making everyone he came in contact with feel special. He will be missed dearly by all. In addition to his wife, Joan, Charlie is survived by his four children: Charles Ruffing Jr, and his wife Carolyn of Rochester, NY:, David Ruffing of Phoenixville, Loretta Garnett and her husband Tom of Atglen; Edwin Ruffing and his wife Cindy of Arkansas; former daughter-in-law, Susan Ruffing; 7 grandchildren: Krysta and her husband Jeff of West Chester; Claire and her wife Meghan of Vilnius, Lithuania; Tom and his wife Marlen of Washington, DC; David E, and Matthew of Auburn, Alabama, and Jordan and Aiden of Siloam Springs, Arkansas, and one great-grandchild, Jake. He is also survived by one sister, Jean Kovaleski of Indiana, PA. He was predeceased by an infant granddaughter, Rebecca. Charlie’s funeral mass will be held Saturday, March 30, 2019 at 10:30am at St. Joseph Church 404 Charles Street, Coatesville. Visitation will be held beginning at 9:30 at church. Visitation will also be held Friday, March 29, 2019 from 6-8pm at Wentz Funeral Home 342 East Chestnut Street, Coatesville 610-384-0318. Memorials in Charlie’s honor may be made to St. Joseph Church 404 Charles Street, Coatesville, PA 19320. To send flowers or a remembrance gift to the family of Charles J. Ruffing, please visit our Tribute Store. "Email Address" would like to share the life celebration of Charles J. Ruffing. Click on the "link" to go to share a favorite memory or leave a condolence message for the family.